If there were such thing as a Cashmere Princess, I would be it. Cashmere is my absolute obsession. I would wear it 24/7 if I could and I pretty much do. The creme de la creme of cashmere is milled in Scotland. Burberry is one design house who prides themselves in offering garments made from Scottish yarn. Their sweaters are also manufactured in Italy, a country renowned for its superb craftsmanship. The new Burberry Prorsum Autumn/Winter 2014 collection consists of my new guernsey detail sweater in classic colours (click here to view). The sweater featured also in Burberry Prorsum's Spring/Summer collection as well in classic and brights. 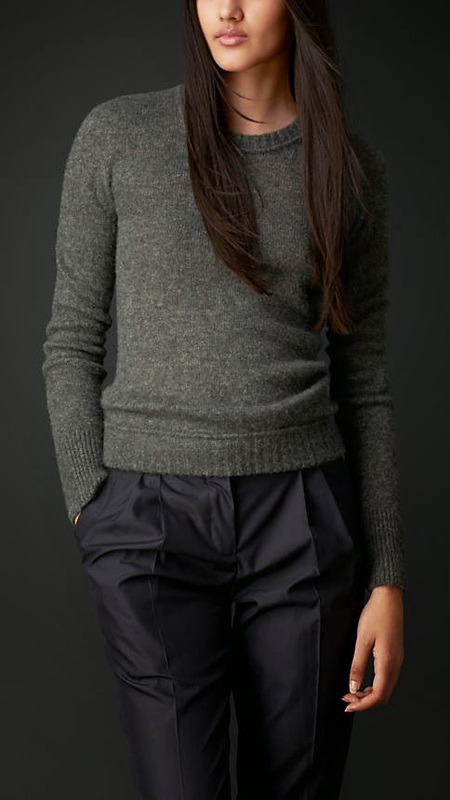 What has caught my eye in the new collection is this cashmere and silk sweater in mid-grey melange tones. It is a more fitted style and I am after a sweater that can be tucked into skirts. This would be perfect. Well, report-writing time is officially over. Now for the parent/teacher interviews next week. Next Friday marks the end of term two and I cannot wait to stop to smell the roses. I will be on holidays officially after this time for two weeks. After all the hard work of the term, I sure do deserve a break! Hope you've been well. Stay stylish.